MET-Rx Original Meal Replacement revolutionized sports nutrition with the METAMYOSYN® Protein Blend! 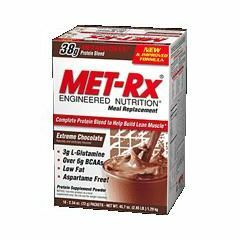 Now new and improved, the “Original” MET-Rx® Meal Replacement, is back and better than ever with an upgraded formula that is free of aspartame and hydrogenated fats while still featuring the exclusive METAMYOSYN® Protein Blend. 38 grams of the exclusive METAMYOSYN® protein blend to help build lean muscle. Free of Hydrogenated Oils, which means absolutely no Trans Fats. Up to 20 grams of carbohydrates to support muscle glycogen needs as well as energy levels at rest and during exercise. 25 Essential Vitamins & Minerals, with 110% DV Calcium to support your body’s nutritional needs. Immediately After Exercise Makes: an excellent post-workout shake by providing fast digesting proteins for immediate muscle support plus slow digesting proteins for extended amino acid delivery and recovery. Before Bed: The high content of slow-digesting proteins in MET-Rx® Meal Replacement makes it a perfect before-bed supplement as it provides “time-released” amino acid delivery to your body while you sleep. Results may vary. Use in conjunction with an intense daily exercise program and a balanced diet including an adequate caloric intake. Approximate value based on individual proteins within product. Actual value for METAMYOSYN may be different. Not a low calorie food. Some sugar naturally occurs in ingredients. See nutrition facts panel for sugar and calorie content.